William A. Orrill was born in King & Queen Co. Virginia. Some sources show his birth as late as 1819 but most are in the range 1811 to 1813. He was a farmer and moved to Madison, Jefferson Co. Indiana with his relatives. He married Lucinda Jane Humphreys in Jefferson Co. Indiana Sept. 8, 1831. Lucinda was born in Garrard Co. Kentucky. July 14, 1812 and was the daughter of Cornelius Thomas Humphreys & Elizabeth Brooks. Service records for William shows that he worked as a mechanic and had dark eyes, gray hair, light complexion and stood 6 feet two inches tall. Census records show him as a farmer and miller. After the birth of one daughter, Elizabeth K. in Jefferson Co. Indiana in 1832, the family moved to Illinois where two daughters Lucinda H. born 1840 and Henrietta A. born 1844 were born. His first son William H. (Harry) was born about 1846 in Illinois. William and family then moved to Iowa in 1847. In 1848 they are found in Locust Grove Township, Jefferson Co. Iowa where their second son Winfield Sylvester was born September 26, 1848. In 1850 census they were in Monroe Township, Mahaska Co. Iowa, where their third son and last child Adonbeck E. (Don), sometimes listed as John E. on some early records, was born May 19, 1850. William owned and operated a mill just outside of New Sharon Iowa. When the Civil War started the Union Army took over the Mill and the town that grew up around this mill became known as Union Mills Iowa. William enrolled and joined for duty in Company H, 3rd Regiment of the Iowa Infantry on May 31, 1861 in Keokuk Iowa for a period of three years. He is listed as absent on furlough in the June-Oct. 1861 Muster Rolls. The reason for this furlough must be due to the fact that his first wife Lucinda Jane died September 12th 1861. Her burial is in the Indianapolis Cemetery in Indianapolis, Monroe Township, Mahaska County, Iowa. The Nov-Dec Muster Rolls William is sick in quarters in St. Louis Missouri. Dec.1861 through Oct. 1962 he is listed as present. On April 6, 1862 William was slightly wounded in the left groin/hip at Pittsburg Landing, Tennessee (Shilo). 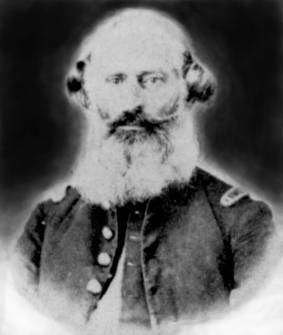 He was promoted to Sergeant 28 Dec. 1862, and it was noted Oct 1863 that he was on daily duty as Ordinance Sergeant. The Nov-Dec Muster Rolls shows that he was absent in Iowa Recruiting Service on 21 Nov 1863 Special Order No. 263 General McPherson. William reenlisted in Davenport Iowa 27 Feb 1864 to serve three years in Company I, 2nd Regiment. William is shown on detached duty in Louisville, Kentucky since 17 Aug 1864 by order of Secretary of War. William was discharged on 4 Jan 1865 to receive a promotion to 1st Lieutenant and appointment to the 122nd U.S.C.T. in Louisville. William married Sophia E. Green on 11 July 1865 in Louisville (she was previously married to Jacob Green, her maiden name is unknown and she had a daughter from this marriage by the name of Amanda Green). William Mustered-out the next day 12 July 1865. William then became a policeman in Louisville. William resided at 822 E. Jefferson in Louisville until his death on 23 June 1875. William’s burial is recorded as being in Eastern Cemetery in Louisville. Sophia filed for a widow’s pension 17 July 1890 in Kentucky Application #437345 and Certificate #372487. Sophia died 16 Apr 1922 and is buried in the Evergreen Cemetery, Chicago, Cook Co. Illinois.